Everyone deserves a Wilde Thyme! We enjoy good food and have a love for soups and dips! As neighbors and good friends, we started our tasty business, Wilde Thyme Foods, in August 2004 by purchasing the recipes for 7 soups and 9 dips. Seeing the possibilities of this business, we followed a passion of creating simple, yet delicious soups, dips, and mixes. Wilde Thyme Foods now offers dozens of different Simple Soups, Simple Soup for Two, Simple Dips as well as several Simple Mixes. We credit our friends, families, customers, restaurants, and cookbooks as inspiration for creating new products. To meet customer requests and needs, we work to develop soups that fit into special categories. We offer vegetarian, vegan, and salt free soups as well as soups that contain no dairy or contain no gluten. 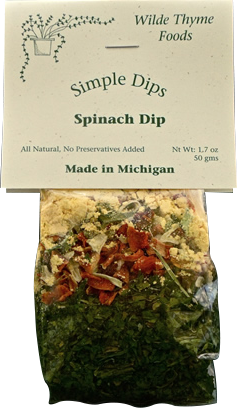 We are continually looking for ways to expand our line of simple, convenient and delicious soups, dips, and mixes. We are committed to making sure that our soups, dips, and mixes contain only the finest ingredients including freeze-dried and dehydrated fruits and vegetables. We consistently search for the best ingredients and sources for our products, whether it is natural cheese powder from a Wisconsin creamery or chocolate powder from Ghirardelli. 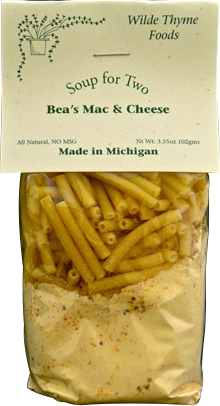 Wilde Thyme Foods is committed to developing products that are simple and quick to prepare. Our soup mixes simply require water to be added to create a delicious home-style meal. Our dip mixes require either sour cream or cream cheese to create tasty party favorites. For consistency, each of our products is hand packaged one at a time. 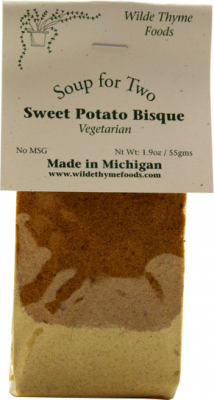 Wilde Thyme products are made in Holland, Michigan, and are licensed through the Michigan Department of Agriculture. Our soup mixes simply require water to be added to create a delicious home-style meal. They cook in 30-45 minutes and make about eight 1 cup servings. Our Soup for Two mixes are perfect for the office, dorm room, camping, or at home. They simply require 2 cups of water and cook in 4 minutes. Our dip mixes are a perfect addition to a party or get-together. We have a wide variety of sweet and savory dips that simply mix with sour cream or cream cheese. 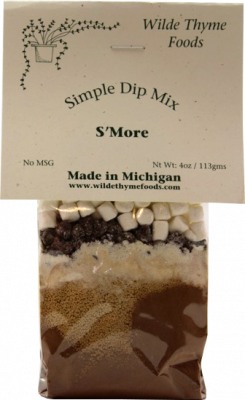 Simple Mixes for cakes, bread, oil seasonings, hummus, pickles, and more! All our amazing dog treat mixes! All of our soup mixes that are Vegetarian! All of our soup mixes that contain no salt. All our soups that contain no dairy. *Manufactured in a facility that processes dairy, wheat, soy, and egg. All of our mixes that contain no gluten! *Manufactured in a facility that processes dairy, wheat, soy, and egg.